Social media has evolved from a nascent marketing channel to an integrated part of all business functions. It’s become critical for businesses to develop a sophisticated approach for how they find, communicate with and support their customers on social. Gone are the days when brands could broadcast discounts, deals and product information and “go dark” when a customer raised a complaint. How our questions and issues are handled by companies across social directly affects how we feel about their brand as a whole. HubSpot’s new Service Hub lives up to that philosophy, focusing on the customer to help bridge the gap between the sales and marketing funnels—as well as the customer journey—to create a more holistic and supportive experience for a brand’s customers. At Sprout our focus is helping brands create real connection with their audiences on social with a platform that encourages authentic, real engagement. Which is why we’re excited that through our new integration, users can now use both the Sprout Social and HubSpot Service Hub together to power your marketing and customer service teams. 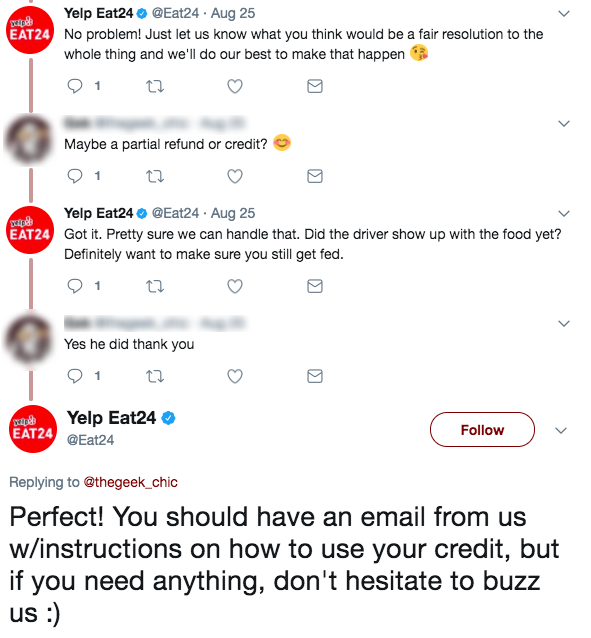 You don’t have to look far to find examples of why responsive and authentic customer care on social media is so important for a brand. In fact, study after study tells us that consumers want to connect with brands on social and that interaction is paramount to building an authentic, long-lasting relationship. If consumers are turning to social media to help resolve their problems, it’s important for you and your brand to be prepared. Building a connection with your customers often takes a personal touch, especially when it comes to customer service. Extending your brand personality into every interaction can mean a lot of coordination and documentation in the backend but it can pay dividends with your audience feels like you’re a person rather than a faceless company. The next most common reason? Forty-five percent say it’s because of an issue with said product or service. Yelp Eat24 accomplished this through creating connection and answering questions via social media in a friendly and personable way. When fielding hundreds if not thousands of customer service questions on social, it can be overwhelming for a team to juggle a help desk queue and monitoring social media inquiries. Smart businesses are automating where they can and focusing the human touch on high impact interactions. And consumers will not wait more than four hours for a response time on social, while the average brand responds in 10 hours (Sprout Social Index, 2016). 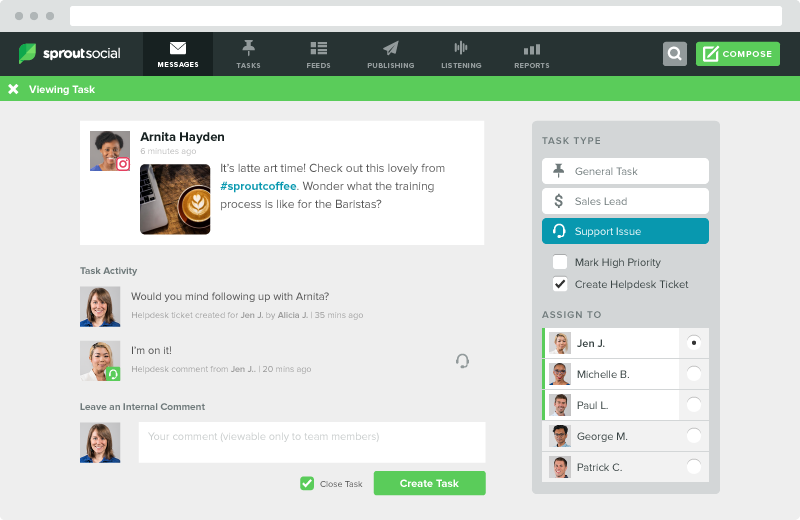 Evernote uses social automation to drive efficient customer care to better serve their customers and scale their team. And when social customer care is a shared initiative, creative and meaningful experiences can be created for your social audiences. Adore Me uses collaborative social customer service to save the team time so that they can romance fans beyond reactive response. Consumers expect more from their interactions with businesses and brands today. Social is in a unique position to be the hub that powers a business forward. Whether you run a small business or work in the enterprise, manage client social at an agency or are building a social media team at your company—social media has the capability to move your entire business forward, not just your marketing. The flywheel approach puts the customer at the center of your business functions. And when connection is at the center of your social strategy, it brings you closer to what your audience wants and needs and enables you to invest in long-term relationships with your customers. As businesses become more customer-centric, lines blur between which department “owns” the customer. It’s when marketing and customer service departments collaborate and work together that they actually provide better, more seamless experiences. When you connect your Sprout Social and HubSpot Service Hub platforms, you’re empowering teams to do what’s right for the customer. Find out more about the Sprout Social and HubSpot integration today.